Do I have metabolic damage? Am I in starvation mode? When someone isn’t losing weight and they think they should be, they sometimes ask if they are eating too little to lose weight. This is a concept that is confusing to a lot of people and you’ll read about it often. Assuming there is no medical condition (like hypothyroidism, for example) in play, the idea of eating too little to lose weight is a misconception. The larger the calorie deficit, the more it slows down. The smaller the deficit, the less it slows. As you lose weight, your calorie needs lower along with metabolism slowing. Smaller people need less food. Sad, but true. Eventually you plateau because you reach maintenance calories for your new size body and new metabolism. The amount of time this takes depends on how much of a deficit, how much you have to lose, and other factors. If you still have weight to lose, you need to either move more to burn more calories or subtract calories from your eating. You need to repeat this cycle until you reach goal weight. This is why I always recommend starting a weight loss plan with your calories set as high as possible to give you plenty of calorie room for adjustments. Many people are surprised at how low they need to take their calories if they plateau repeatedly and go through multiple calorie cutting cycles. If you aren’t losing and think you should be, take a close look at the calories you’re eating. Are you tracking bites of this and that or just meals? Are you weighing and measuring or eyeballing? Are you eating out a lot which is notorious for inaccurate portion sizes? Are you having trouble sticking to plan and including cheat meals or days? You don’t have to do this permanently, but it is a good starting point to figure out where the issue lies. You might find out you’re eating more than you think. Chop the cauliflower into small pieces so that they fit inside the tacos. You don’t want big florets for this. Heat the broth, sriracha, and garlic in a pot over medium heat and bring to a boil. Add the cauliflower pieces and the jalapeno slices and stir to mix. Simmer for about 2 minutes to soften and flavor the veggies. You could also probably do this step in the microwave as an option. Preheat your oven to 400 degrees. Drain the veggies and toss them in the spices to coat them well. Spread them on a cookie sheet or pan in a single layer and bake at 400 degrees for 20 minutes or so until they start to crisp. Stir about halfway through so they crisp evenly. Remove from oven. While the veggies are baking, you can make the slaw. Chop the cabbage and carrots into small pieces (cole slaw sized, LOL). Toss them in a bowl with the vinegar, lime juice and cilantro. Once the veggies are done, remove them from the oven. Divide the veggies evenly in the tortillas, and top with the slaw. Garnish with sliced avocado and other taco toppings you enjoy like sliced lime, onions, salsa. 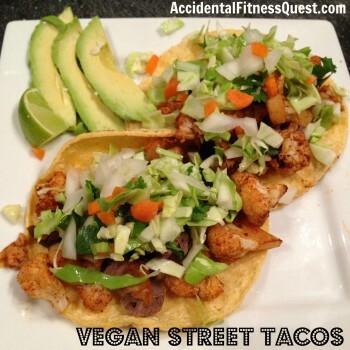 Makes 4 servings of 2 tacos each at approximately 207 calories – 5g protein, 31g carbs, 7g fat. I made these tacos as part of a vegan experiment, and thought they were wonderful as is. For the meat lovers out there, simply slip in some grilled chicken or sliced steak and no one will notice you’ve got it under your mountain of cauliflower. I had my leftovers with 3 oz of grilled steak and it only added 139 calories, 19g of protein, and 7 grams of fat. Not bad for a huge plate of street tacos with slaw and avocado. You can also make a great taco salad for lunch the next day too.